The Swedish Armed Forces (Swedish: Försvarsmakten, literally “the Defense Force”) is the government agency that forms the military forces of Sweden, and which is tasked with defense of the country, as well as promoting Sweden's wider interests, supporting international peacekeeping efforts, and providing humanitarian aid. It consists of: the Swedish Army, the Swedish Air Force and the Swedish Navy, with addition of a military reserve force, the Home Guard. Since 1994, all the Swedish armed services are organized within a single unified government agency, headed by the Supreme Commander, even though the individual services maintain their distinct identities. King Carl XVI Gustaf of Sweden is traditionally considered Honorary General and Admiral à la suite. The Swedish Armed Forces consist of a mix of volunteers and conscripts (gender-neutral conscription was introduced in 2017). About 4,000 men and women are called up for service every year. Units from the Swedish Armed Forces are currently on deployment in several international operations either actively or as military observers, including Afghanistan as part of the Resolute Support Mission and in Kosovo (as part of Kosovo Force). Moreover, Swedish Armed Forces contribute as the lead nation for an EU Battle Group approximately once every three years through the Nordic Battlegroup. Sweden has close relations with NATO and NATO members, and participates in training exercises like the Admiral Pitka Recon Challenge, and Exercise Trident Juncture 2018. Sweden also has a strong cooperation with its closest allies of the Nordic countries being part of the Nordic Defence Cooperation NORDEFCO and joint exercises such as the exercise Northern Wind 2019. In total, about 10,000 people participate in Northern Wind, of which approximately 7,000 come from prioritized cooperation nations: Finland, Norway, the US and the UK. Sweden has not participated in an officially declared war since the 1814 Swedish–Norwegian War, although e.g. Swedish aircraft took part in the NATO-led 2011 military intervention in Libya. Swedish foreign policy has managed to keep Sweden out of war through a policy of neutrality. Sweden also provides information to its citizens in case of an emergency being part of the concept of total defense with pamphlets being sent home to all households. The publication contains information about how to act in a situation of national crisis and most notably, nuclear war. The pamphlets (titled "If the war comes") were distributed to all households from 1943 to 1961; after 1961 some of the information from the pamphlet was printed in every phone book until 1991, the end of the Cold War. In 2018 the pamphlet was renewed and distributed under the title "If the crisis or the war comes" (Swedish: Om krisen eller kriget kommer). The new pamphlet includes the well-known quote from the older ones (in case of enemy invasion): "Every statement that the resistance has ceased is false. Resistance shall be made all the time and in every situation. It depends on You - Your efforts, Your determination, Your will to survive." After a period of enhanced readiness during World War I, the Swedish Armed Forces were subject to severe downsizing during the interwar years. When World War II started, a large rearmament program was launched to once again guard Swedish neutrality, relying on mass conscription to fill the ranks. After World War II, Sweden considered building nuclear weapons to deter a Soviet invasion. From 1945 to 1972 the Swedish government ran a clandestine nuclear weapons program under the guise of civilian defense research at the Swedish National Defence Research Institute. By the late 1950s the work had reached the point where underground testing was feasible. However, at this time the Riksdag prohibited research and development of nuclear weapons, pledging that research should be done only for the purpose of defense against nuclear attack. They reserved the right to continue development of nuclear weapons in the future. The option to continue development of weapons was abandoned in 1966, and Sweden's subsequent signing of the Non-Proliferation Treaty in 1968 began the wind-down of the program, which finally concluded in 1972. During the Cold War, the wartime mass conscription system was kept in place to act as a deterent to the Soviet Union, seen as the greatest military threat to Sweden. The end of the Cold War and the collapse of the Soviet Union meant that the perceived threat lessened and the armed forces were downsized, with conscription taking in less and less recruits until it was deactivated in 2010 (and then reactivated in 2017). After twenty years of cooperation with NATO, starting with the Partnership for Peace back in 1994, Sweden was one of five partners granted enhanced opportunities for dialogue and cooperation at the Wales Summit in 2014. The status of Enhanced Opportunities Partner provided a platform for developing a more flexible and individualized relationship, in addition to other partner formats. It coincided with Russia’s illegal annexation of Crimea and military intervention in Eastern Ukraine, and also with NATO defense bill for 2016-2020. Both the need to review NATO's own defense policy and the dramatic signal that a European country was prepared to violate the existing security order using military might, gave momentum to the new partner platform. Conscription was reintroduced in 2017 to supplement the insufficient number of volunteers signing up for service. To assert the territorial integrity of Sweden. To deploy forces to international peace support operations. Sweden aims to have the option of remaining neutral in case of proximate war. However, Sweden cooperates militarily with a number of foreign countries. As a member of the European Union, Sweden is acting as the lead nation for EU Battlegroups and also has a close cooperation, including joint exercises, with NATO through its membership in Partnership for Peace and Euro-Atlantic Partnership Council. In 2008 a partnership was initiated between the Nordic countries to, among other things, increase the capability of joint action, and this led to the creation of NORDEFCO. As a response to the expanded military cooperation the defence proposition of 2009 stated that Sweden will not remain passive if a Nordic country or a member of the European Union were attacked. Recent political decisions have strongly emphasized the capability to participate in international operations, to the point where this has become the main short-term goal of training and equipment acquisition. However, after the 2008 South Ossetia war territorial defense was once again emphasized. Until then most units could not be mobilized within one year. In 2009 the Minister for Defence stated that in the future all of the armed forces must capable of fully mobilizing within one week. In 2013, after Russian air exercises in close proximity to the Swedish border were widely reported, only six percent of Swedes expressed confidence in the ability of the nation to defend itself. The Swedish multirole fighter, the Saab JAS 39 Gripen. The Swedish Visby class corvette. 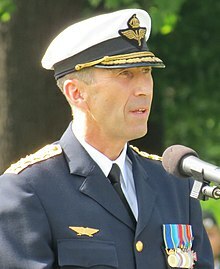 The Supreme Commander (Swedish: Överbefälhavaren) is a four-star general or flag officer that is the agency head of the Swedish Armed Forces, and is the highest ranking professional officer on active duty. The Supreme Commander in turn reports, normally through the Minister for Defence, directly to the Government of Sweden, which in turn answers to the Riksdag. The King of Sweden was, before the enactment of the 1974 Instrument of Government, the de jure commander in chief (Swedish: högste befälhavare), but currently only has a strictly ceremonial and representative role with respect to the Armed Forces. The Swedish Armed Forces consists of three service branches; the Army, the Air Force and the Navy, with addition of the military reserve force Home Guard. Since 1994, the first three service branches are organized within a single unified government agency, headed by the Supreme Commander, while the Home Guard reports directly to the Supreme Commander. However, the services maintain their separate identities through the use of different uniforms, ranks, and other service specific traditions. The Armed Forces Headquarters is the highest level of command in the Swedish Armed Forces. It is led by the Supreme Commander with a civilian Director General as his deputy, with functional directorates having different responsibilities (e.g. the Military Intelligence and Security Service). Overall, the Armed Forces Headquarters have about 1000 employees, including civilian personnel. Some of the schools listed below answer to other units, listed under the various branches of the Armed Forces. The Nordic Battle Group is a cooperative formation of the Swedish Armed Forces alongside mainly the other Nordic countries but also some of the Baltic countries as well as Ireland, tasked as one of the EU Battle Groups. The headquarter garrison for this group is currently situated in Enköping Sweden. Currently, Sweden has military forces deployed in Afghanistan with the NATO-led Resolute Support Mission. Swedish forces were part of the previous International Security Assistance Force (2002–2014) in Afghanistan. Sweden is also part of the multinational Kosovo Force and has a naval force deployed to the gulf of Aden as a part of Operation Atalanta. Military observers from Sweden have been sent to a large number of countries, including Georgia, Lebanon, Israel and Sri Lanka and Sweden also participates with staff officers to missions in Sudan and Chad. Sweden has been one of the Peacekeeping nations of the Neutral Nations Supervisory Commission that is tasked with overseeing the truce in the Korean Demilitarized Zone since the Korean war ended in 1953. A battalion and other units were deployed with the NATO-led peacekeeping SFOR in Bosnia and Herzegovina (1996–2000), following the Bosnian War. Swedish air and ground forces saw combat during the Congo Crisis, as part of the United Nations Operation in the Congo force. 9 army battalions were sent in all, and their mission lasted 1960–1964. Chart showing the size of the Swedish Armed Forces 1965–2010. Yellow = number of air wings; Blue = number of infantry regiments; Red = number of artillery regiments; Green = number of coastal artillery and amphibious regiments. In mid-1995, with the national service system based on universal military training, the Swedish Army consisted of 15 maneuver brigades and, in addition, 100 battalions of various sorts (artillery, engineers, rangers, air defense, amphibious, security, surveillance etc.) with a mobilization-time of between one and two days. When national service was replaced by a selective service system, fewer and fewer young men were drafted due to the reduction in size of the armed forces. By 2010 the Swedish Army had two battalions that could be mobilized within 90 days. When the volunteer system has been fully implemented by 2019, the army will consist of 7 maneuver battalions and 14 battalions of various sorts with a readiness of one week. The Home Guard will be reduced in size to 22,000 soldiers. After having ended the universal male conscription system in 2010, as well as deactivating conscription in peacetime, the conscription system was re-activated in 2017. Since 2018 both women and men are conscripted on equal terms. The motivation behind reactivating conscription was the need for personell, as volunteer numbers proved to be insufficient to maintain the armed forces. Officer OFF/K – Regular continuously serving officers (OF1-OF9). Officer OFF/T – Reserve part-time officers (OF1-OF3). Specialistofficer SO/K – Regular continuously serving NCO (OR6-OR9). Specialistofficer SO/T – Reserve part-time serving NCO (OR6-OR7). GSS/K – Regular continuously serving enlisted (OR1-OR5). GSS/T – Reserve part-time serving enlisted (OR1-OR5). GSS/P – Personnel in wartime placement (OR1-OR5). Annual recruitment of GSS is assumed to be about 4,000 persons. In 2008, professor Mats Alvesson of the University of Lund and Karl Ydén of the University of Göteborg claimed in an op-ed, based on Ydén's doctoral dissertation, that a large part of the officer corps of the Swedish Armed Forces was preoccupied with administrative tasks instead of training soldiers or partaking in international operations. They claimed that Swedish officers were mainly focused on climbing the ranks and thereby increasing their wages and that the main way of doing this is to take more training courses, which decreases the number of officers that are specialized in their field. Therefore, the authors claimed, the Swedish Armed Forces was poorly prepared for its mission. Major changes have been made to the officer system since then. The transformation of the old invasion defence-oriented armed forces to the new smaller and more mobile force has also been criticized. According to the Supreme Commander of the Swedish Armed Forces the present defence budget will not be enough to implement the new defence structure by 2019. And that even when finished the armed forces will only be able to fight for a week at most. During 2013 several Russian Air Force exercises over the Baltic Sea aimed at Swedish Military targets have made the future of the Swedish Armed Forces a hot topic and several political parties now want to increase defence funding. Gen. Micael Bydén, the Supreme Commander of the Swedish Armed Forces. i. The lowest warrant officer, sergeant, had relative rank just below the lowest officer rank, fänrik. iii. The highest warrant officer rank, förvaltare, had relative rank between first lieutenant and captain. In 1972 the personnel structure changed, reflecting increased responsibilities of warrant and non-commissioned officers, renaming the underofficerare as kompaniofficerare, giving them the same ranks as company grade officers (fänrik, löjtnant, kapten). Underbefäl was renamed plutonsofficerare and given the rank titles of sergeant and fanjunkare, although their relative rank were now placed below fänrik. The commissioned officers were renamed regementsofficerare, beginning with löjtnant. The three-track career system was maintained, as well as three separate messes. A major change in the personnel structure in 1983 (NBO 1983), merged the three professional corps of platoon officers, company officers, and regimental officers into a one-track career system within a single corps called professional officers (yrkesofficerare). The three messes were also merged to one. In 2008 the Riksdag decided to create a two-track career system with a category called specialistofficerare. When implementing the parliamentary resolution the Supreme Commander decided that some ranks in this category should, like the old underofficerare ranks in 1960–1972, have a relative rank higher than the most junior officers. ^ a b c "Duties of the Monarch – Sveriges Kungahus". Archived from the original on 2015-03-16. Retrieved 2015-03-19. ^ SFS 2010:448. Lag (1994:1809) om totalförsvarsplikt. Stockholm: Department of Justice. "Lag (1994:1809) om totalförsvarsplikt". Archived from the original on 2010-12-17. Retrieved 2010-11-13. ^ TT. "Värnplikten återinförs – tusentals kallas till mönstring". SvD.se (in Swedish). Archived from the original on 2017-03-02. Retrieved 2017-03-02. ^ "Regeringen inför värnplikt i Sverige – beslut i dag". Aftonbladet (in Swedish). Archived from the original on 2017-03-02. Retrieved 2017-03-02. ^ Försvarsmakten. "En kombination av frivillighet och plikt". Försvarsmakten (in Swedish). Archived from the original on 2017-03-02. Retrieved 2017-03-02. ^ Försvarsmakten. "Personalsiffror". Archived from the original on 2015-03-25. Retrieved 2015-04-04. ^ "Statens budget i siffror". Regeringskansliet (in Swedish). Swedish Government. 15 November 2018. Retrieved 13 April 2019. ^ a b c Persson, Alma; Sundevall, Fia (2019-03-22). "Conscripting women: gender, soldiering, and military service in Sweden 1965–2018". Women's History Review. 0 (0): 1–18. doi:10.1080/09612025.2019.1596542. ISSN 0961-2025. ^ "Nordic Battlegroup – Försvarsmakten". Mil.se. 2009-01-19. Archived from the original on June 3, 2009. Retrieved 2009-08-05. ^ "Nordic defence cooperation – Försvarsmakten". Mil.se. 2009-03-06. Archived from the original on 2009-09-03. Retrieved 2009-08-05. ^ "Our task – Försvarsmakten". Mil.se. 2007-09-25. Archived from the original on 2009-08-03. Retrieved 2009-08-05. ^ "The Swedish military service system – Försvarsmakten". Mil.se. 2007-09-28. Archived from the original on 2009-09-01. Retrieved 2009-08-05. ^ "Ett användbart försvar – med kraftigt stärkt försvarsförmåga". regeringen.se. Archived from the original on 25 February 2015. Retrieved 25 February 2015. ^ Benitez, Jorge (30 April 2013). "Most Swedes doubt Sweden can defend itself". acus.org. Atlantic Council. Archived from the original on 3 July 2013. Retrieved 30 April 2013. ^ "Armed Forces Headquarters (HKV) – Försvarsmakten". Mil.se. 2008-12-01. Retrieved 2009-08-05. ^ Swedish Armed Forces. "Training Centres". Försvarsmakten. Archived from the original on 20 March 2015. Retrieved 25 February 2015. ^ Swedish Armed Forces. "Korea – NNSC". Försvarsmakten. Archived from the original on 6 April 2016. Retrieved 25 February 2015. ^ Ivarsson, Ulf (February 2007). "Pendeln måste slå tillbaka". Hemvärnet (1): 5. ^ "Karriärstyrda officerare skapar inkompetent försvar" (in Swedish). DN.se. 2008-11-06. Archived from the original on 2012-11-14. Retrieved 2013-03-28. ^ "Försvar med tidsgräns". SvD.se. Archived from the original on 23 March 2015. Retrieved 25 February 2015. ^ Stockholm TT och SvD.se. "Ryska bombflyg övade mot Sverige". SvD.se. Archived from the original on 15 April 2015. Retrieved 25 February 2015. ^ "Ryskt flyg övade anfall mot Sverige". SvD.se. Archived from the original on 23 March 2015. Retrieved 25 February 2015. ^ "Majoritet vill rusta militärt mot Ryssland". Aftonbladet. Archived from the original on 25 February 2015. Retrieved 25 February 2015.